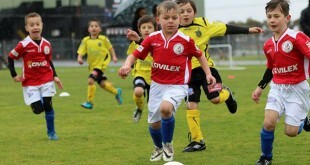 The Melbourne Knights have run out three-nil winners in what was a pleasant afternoon for football at Knights Stadium. 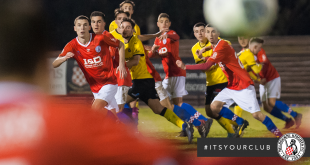 An early goal from Shayan Alinejad and two second half goals from brothers Jacob and Anthony Colosimo saw the Knights retain 4th spot in the Victorian Premier League. The Stars could have had an early goal when Andrew Viola headed just wide from a dead ball delivery in the 3rd minute. But it was the Knights who took the lead after just six minutes, when Anthony Colosimo found Shayan Alinejad at the back post with a great cross, who had no hesitation in putting the ball into the back of the net. 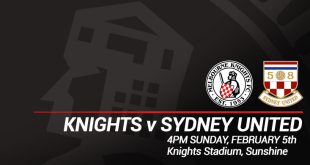 The Knights could have had another three minutes later, when Alinejad played a great through ball for Jacob Colosimo, who could only put the ball into the arms of Stars goalkeeper Kerim Koc. The best chance of the half for the away team came through Ridvan Saglam in the 11th minute, when his half volley when just wide of the goal after the Knights defence failed to clear a cross. The remainder of the first half was uneventful, apart from Marijan Cvitkovic coming off with a nasty gash after clashing heads with Stars captain Ramazan Tavsancioglu. The Stars had the better chances in the opening stages of the second half. Marvin Hamilton got a long shot off from outside the box, forcing Knights shot stopper Chris May to get down and make a save. It was Hamilton again in the 55th minute, who broke into the box forcing May to make an excellent save and deny the Stars an equaliser. The home side looked to have secured the result in the 77th minute, as Jacob Colosimo got onto the end of Alinejads cross, placing a great looping header over the keeper and into the back of the net. But the Knights weren’t done yet. Just two minutes later, Tommy Fraser played a quick free kick to Anthony Colosimo on the edge of the box, who took a few steps before blasting a shot which took a deflection from defender Salit Fuler before finding the back of the net. 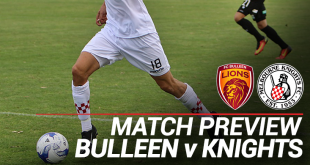 The win takes the Knights to 11 points, only two points behind 2nd placed Bentleigh Greens who host the Knights on Friday night at Kingston Heath.